The main decision is which level of stabilisation you would like in your mattress. Stabilisation is the level of fluidity that the mattress has. F0 is the most fluid and will flow with the water. F8 is more solid and will feel more like gel than water. The levels in between are a sliding scale of stabilisation/fluidity. To find out which is right for you, we recommend you try the waterbeds in store. Will it help my bad back? Almost certainly yes. Waterbeds offer maximum pressure relief and total body support, minimising the need to toss and turn through the night. Sleep quality improves overnight. Will it be too heavy for my floor? Weight is rarely a problem. There is roughly 1 bath load of water in a double waterbed and it is distributed over a much larger area than a typical bath. Not convinced? Come to the Marlow shop, we have a double water bed in the second storey of an 18th century bungalow, no reinforcements needed. Very. The vinyl mattress can be cleaned daily or weekly to prevent a build up of dust and mites. The cover is also zip removable and washable. 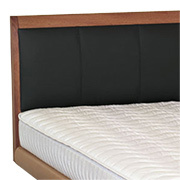 Waterbeds will offer a constant level of support throughout their life time and they never sag. A typical life span for a water mattress is between 10 and 15 years. No - forget what you see in Hollywood movies. A water mattress is a non-pressurised environment so when you remove the cap and stopper and even sit on the mattress, you won't lose any water. If you do happen to spill any, it is contained in a safety liner that sits inside your frame and can be easily mopped up. Can my dog or cat damage the mattress? This is highly unlikely to happen, if anything they enjoy the warmth and comfort as much as we do. How would I repair a puncture? For all but the most severe punctures, the easy answer is to use an appropriate repair kit. Once in place it will restore the mattress to its full lifetime's use with no detrimental effect. In most cases a simple repair can be completed without having to empty the bed. My partner prefers a softer/firmer mattress to me - what do you recommend? It would be worth looking at the dual mattress option. Two single mattresses with different stabilisation, separate heaters, within the same bed frame. Each side can be tuned to that persons needs and you won't be able to feel the divide at all. Do I unplug the heater in the summer? No. Even in a hot summer your average bedroom temperature will be below your normal skin temperature. Simply leave the heater plugged in - the difference will be that in the summer the heater will be on less than in the winter. It's very simple. Add Akva Long Life waterbed conditioner directly into your mattress once a year. This will keep the water clean and help to keep the mattress vinyl supple. Then wipe the mattress clean once a week with Akva Vinyl cleaner and the top cover can be zipped off for machine washing. You do not need to empty and drain your mattress regularly, only when you wish to move the bed. What do I do if I am moving house? Please call us to discuss before you do anything. There are some specific guidelines to follow when emptying a water mattress. We can advise you on how to dismantle the Akva bed if you wish to do it yourselves or we can arrange to book a waterbed installer for you. If I choose a waterbed, do you come and install it? Yes we would recommend a professional install for the first time buyer. We will also be able to set the water level in the mattress to suit the individuals using it so you will know what suits you if you decide to move it yourselves in future.